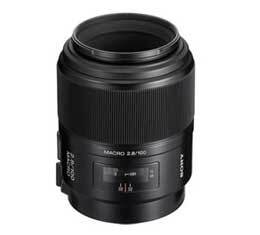 The SAL100M28 100mm F2.8 Macro Lens from Sony is capable of AF shooting down to life-size, is great for close-up shots, and can also be used as a normal lens. It descriptive performance delivers high-contrast and high-resolution, while its circular aperture offers a beautiful defocused effect. Good holding performance comes from its built-in auto clutch (non-turning focus ring in AF). The SAL100M28 Marco Lens is equipped with a focus hold button and focus range limiter to improve operability.